Chart No. 56 - Correcting Body Rotation Thru [Through] the Hip Joint Articulation and the Os Calcis [Calcaneus] Position and Reflex on the Side of the Short and Tense Leg. The lower contact is on the os calcis [calcaneus] as shown here with a firm contact - bending the foot outward while the thumb pushes on the tense and tender spot on the heel bone to release its friction and line it up with the center line of the leg as shown on Chart 54, Fig. 1 + 3. The patient lies on the side with the short leg up so it can be treated. The upper contact is usually from the anterior around the head of the femur to the crest of the ilium where the greatest tension exists. Pressure is applied on tight bands of musculature and held firmly until relaxation takes place. In this manner the area around the acetabulum is released of spastic fibres [fibers]. The direction of the contact is across the tense fibres [fibers] found. The heel bone contact is held at the same time to establish coordinated correction and energy flow by polarity. Holding these two contacts for just a few minutes will often produce astonishing results. The short leg will lengthen and the body line up on the gravity string will be normal or much improved. This can be done on either side of the body where ever [wherever] the short leg is. The position of the patient on the side assists the operator in applying leverage at the heel and at the acetabulum tensions found. This unique move of double contacts can be applied to other bones in the foot and the glutei fibre [fiber] tensions. There is an energy current flow established in the patient thru [through] the release of pent up waves in the hyper tensed areas. Better conduction is established thru [through] polarity contacts. Fig. 2 illustrates gravity pull from the heel bone thru [through] the sacro iliac [sacroiliac] articulation to the occiput by two straight lines. 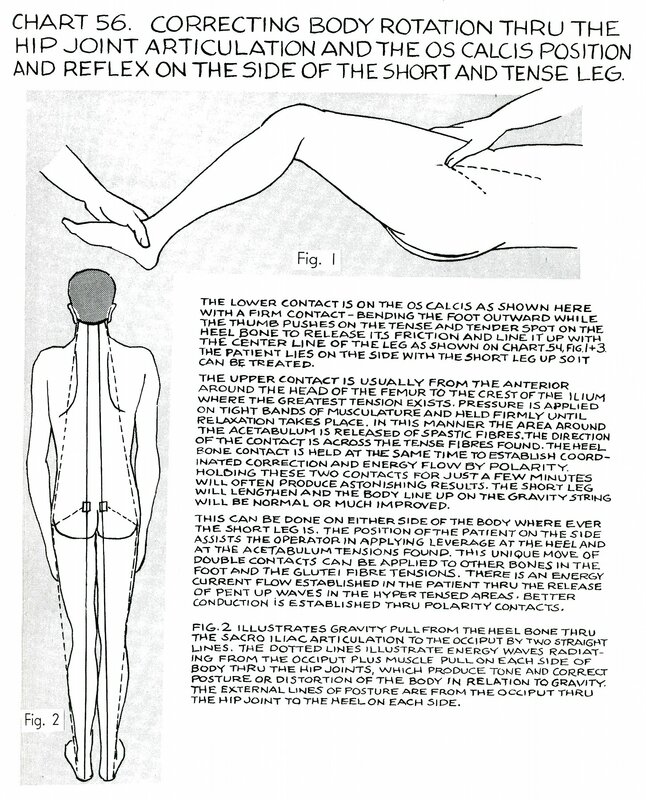 The dotted lines illustrate energy waves radiating from the occiput plus muscle pull on each side of body thru [through] the hip joints, which produce tone and correct posture or distortions of the body in relation to gravity. The external lines of posture are from the occiput thru [through] the hip joint to the heel on each side.